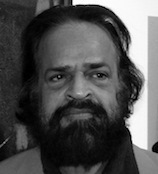 Achuthan Kudallur was born in 1945 in Kerala. He is a self-taught artist with a degree in Civil Engineering. He was a part of Madras Art Club, which functioned within the Government College of Art, Chennai. Later he shifted to painting abstracts while he was in search of a better medium for self-expression. In 1990 and 1992 he took part in group exhibitions in Mumbai, Madras, Calcutta and France. In 1989 he participated in a group show in India and Czechoslovakia. In 1988 and 1990 he participated in the Biennale in Bhopal. In 1991 he participated in the VIIth Triennale in New Delhi and participated in the 3rd Asian Art Show at Fukoka, Japan. He participated in a group show at the Defina Gallery, London. In 2001 he served as the commissioner for the 10th Indian International Triennale. In 1993, 1996 and 2009 he participated in group shows in Mumbai, Madras, Singapore and Munich. In 2010 to 2012 he took part in group shows in Mumbai and Kolkata. He won the Tamil Nadu Lalit Kala Akademi Award and later won the National Academy Award in New Delhi. He lives and works in Chennai.